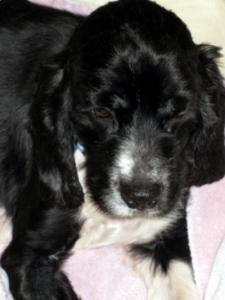 We are on a waiting list at Mid-Atlantic English Springer Spaniel Rescue. We've been watching all the dogs who have come in to the system and then been adopted to new homes. We didn't want to adopt until this past weekend as we were going out of town a couple of times and wanted to get a dog familiar with us before we took him or her on the road, so to speak. We sent an email to the group to say we were interested in Raggs. He is a most snuggly looking dog. He was a stray in South Carolina before he was fostered with a MAESSR home. His back leg was broken but he is on the mend now. He is a mellow fellow which we like (don't mind watching lively dogs, but mellow is better for us) and he is very small (under 30 pounds.) He is now listed at 2 but it had been 4 years old. He does look young to me in this picture. Isn't he a pretty (um, excuse me,) handsome boy? No doubt you will be seeing way more pictures of him if we are allowed to adopt him. Now, I must get on with the quilting ... I haven't done a thing on it since Tuesday! Yikes! I was out running errands yesterday and actually bought a new collar for our new dog. Not that we knew we were coming close to getting a new dog! Hum, maybe he needs his own quilt? Yes, he does need his own quilt. What a lucky dog to have you come along and love him.